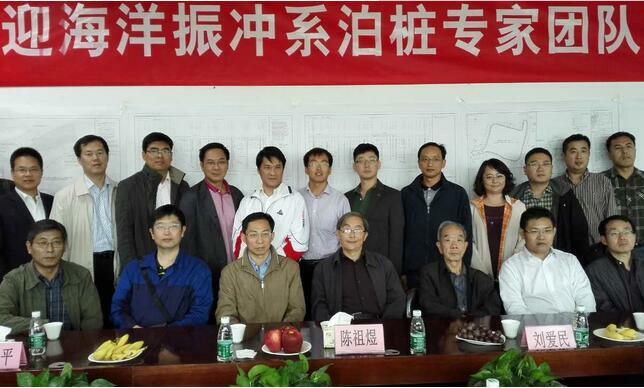 In September 29, 2015, the marine mooring pile vibroflotation expert seminar was held successfully in our company. By Chen Zuyu academician marine vibroflotation mooring piles team of experts to visit our company vibroflotation test field of prestressed vibroflotation mooring pile "on-site to observe the test. After the end of the trial in the company conference room held on the marine mooring vibroflotation pile technology seminar. Guests: Wang Youhua (Chinese petroleum Offshore Engineering Co. Ltd, the director of science and Technology) Liu Jianping (deputy general manager of three new energy Qinghai branch), Lian Jijian (College of architectural engineering Tianjin University ), Zhejiang,(the vice president of University Institute of Architectural Engineering), Du Xiaokai (Professor of water resources planning and Design General Institute of Hydropower Engineering), Sean (Chinese water conservancy and hydropower Foundation Engineering Bureau Chief Engineer), Liu Aimin (in the Tianjin Harbour Engineering Research Institute deputy chief engineer), Wang Yujie (Chinese Institute of water conservancy and hydropower geotechnical Institute)Zhao Yufei long, (director of Chinese Institute of water conservancy and hydropower geotechnical Institute), Yu Hongzhi (Beijing vibroflotation engineering Limited). The meeting presided over by Chen, academician of the Chinese Academy of engineering, he first expressed advantages of vibroflotation method in two of new areas of offshore wind power and oil drilling platform, clearly pointed out application of vibroflotation technique in these two areas will be the high cost of offshore wind power platform occurred a revolutionary change.Our Company vice president Zhu Xiaoyong was introduced in detail vibroflotation equipment construction process characteristics to everyone. Then the guests have a lively discussion of this topic.The meeting lasted three hours. Through this conference, the experts fully affirmed the advantage of vibroflotation construction method in marine soft foundation processing, the proposed "prestressed vibroflotation mooring pile" in the application of offshore wind power and offshore drilling platform is full of expectations. At the same time,contribution to the company to be sure in this field.